Because it was "formally" requested, we have been sent a photograph of an observatory rabbit. 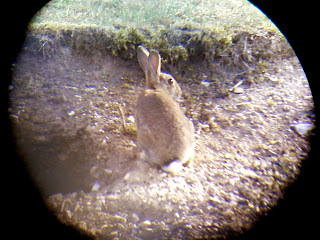 This elusive creature was photographed in the early morning near its burrow in the main observatory compound. Although cute and fluffy, these animals will chew through any and everything, making no distinction between twigs and LOFAR LBA guy wires as is completely nautral for rbbits. In fact, the very first test LBA, which was located in the 4.5m dish compound, was repeatedly attacked. When the guy wire is bitten through, the antenna will quickly fall over in the breeze or simply under the tension of the elastic on the opposite side. The rabbits make no distinction between elastic and nylon and will chew through whatever than can get their teeth into. It is said that every international LOFAR site has its own special wildlife pest... at Chilbolton it's the rabbits. We love our Chilbolton rabbits, we just don't want them to destroy the antennas - hence the fence we previously talked about.